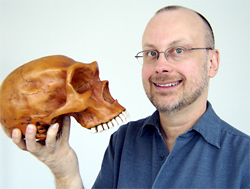 Robert J. Sawyer is one of only eight writers ever to win all three of the science-fiction field’s top awards for best novel of the year: the Hugo (which he won in 2003 for Hominids), the Nebula (which he won in 1996 for The Terminal Experiment), and the John W. Campbell Memorial Award (which he won in 2006 for Mindscan). In 2014, he was won of the initial inductees in the Canadian Science Fiction and Fantasy Hall of Fame, and in 2016 he was made a Member of The Order of Canada, the highest civilian honor bestowed by the Canadian government. According to Locus, he has won more awards as a science fiction or fantasy novelist than anyone else in the history of those genres. The ABC TV series FlashForward was based on his Aurora Award-winning novel of the same name, and he serves as consultant on the TV series and wrote the 19th episode, “Course Correction.” He also wrote the teleplays for “To Boldly Go,” the two-part series finale for the popular Star Trek Continues web series. Rob’s other novels include Starplex, Frameshift, Factoring Humanity, Calculating God, Humans, Rollback, and Wake, all of which were Hugo Award finalists; in total he’s authored 23 novels. His latest is Quantum Night. In 2008, Rob won China’s Galaxy Award, that country’s top honor in SF, for Most Popular Foreign Author. He’s won Japan’s top SF award, the Seiun, for best foreign novel three times, and Spain’s 6,000-euro Premio UPC de Ciencia Ficción an unprecedented three times as well. In addition, he’s won Analog’s Analytical Laboratory Award, the Crime Writers of Canada’s Arthur Ellis Award, and Science Fiction Chronicle’s Reader Award, all for best short story of the year. He was the first science fiction author to have a website (at sfwriter.com), was a pioneer of giving away fiction online (doing so since 1995), had a blog even before the word “blog” existed, tweets as RobertJSawyer, and is active on Facebook. But he’s even more fun in the flesh, so come up and say hello.